Just a quick check-in today to play along with the day seven of challenge over at Papertrey Ink. 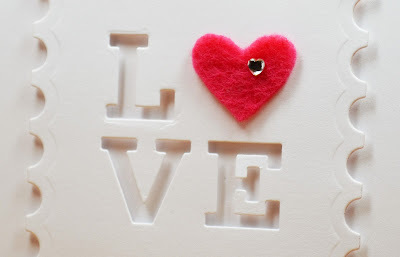 I used my PTI alpha dies to cut the letters out and the hand cut the felt heart. It's hard to see, but I put a small heart-shaped gem inside the felt heart (a la e.e. cummings). Stop by Nichole Heady's blog! You still have time to join in the fun! Congratulations! You really rose to the challenge! What an exquisitely elegant card. I have the alpha dies, but I've never thought about using their space popped up off the surface. What a great idea. All that white with the tiny touch of red. Just stunning. Thank you for sharing! Love this! Love the white on white, the negative space, the postage stamp edge, the pop of pink! Great job! Completely adorable! I am so pinning this to CASE later. You totally nailed clean & simple. This is one of the most creative things I've seen all day. I love the entire concept. I have almost everything on your card, and would never have thought of this in a million years. I'm pinning and CASing this one for sure. LOVE it :) especially the nod to ee cummings....white-on-white is hard for me and I love how effortless you make it look!